The magnificent beachfront Villa Alma Rosa is located on the prestigious Jade Beach, an exclusive area 5 minutes south of Akumal. Considered to be one of the finest villas along the coast, this upscale home is exceptionally spacious, boasting 4,000 square feet of luxurious beachfront living. The 4 large bedrooms with ensuite bathrooms have amazing ocean views. Villa Alma Rosa was designed for a French artist and her family. Vibrant Mexican colors, fabrics, artwork, natural stones and wood complement and contrast with the contemporary zen-style villa. 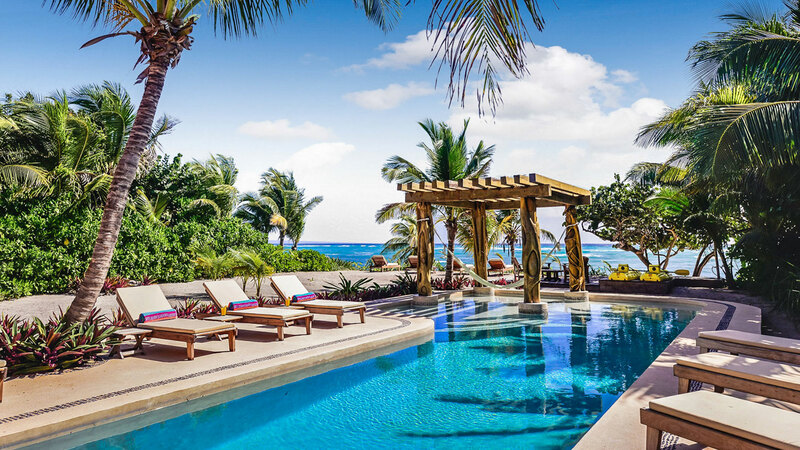 On entering Alma Rosa you are welcomed by the mesmerizing blue hues of the Caribbean. Receive complimentary chef and butler services for breakfast, lunch and dinner. Groceries are an additional cost plus a 20% shopping fee applies.